A commanding presence within the city's center, The St. Regis Mexico City is ensconced in the sleek, 31-story Torre Libertad. 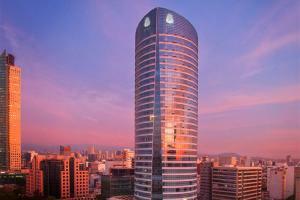 It overlooks the Paseo de la Reforma in the heart of one of the city's most exciting zones. Revel in architectural legend Cesar Pelli's iconic design; be pampered in the exclusive Remède Spa and refreshed in the indoor swimming pool. Take in sweeping views of the city's historic plazas and bustling culture from 189 comfortably sleek guest rooms, including 36 suites and a grand presidential suite. Located on Paseo de la Reforma, in the heart of Mexico City. J&G Grill - Finest quality steak and seafood; King Cole Bar - Cocktails and small plates; Diana Restaurant - Mexican cuisine.